The name “Leggiero” is an Italian musical term meaning “light touch”. Organized in 1993, the Leggiero Strings & Chamber Orchestra is a group of professional musicians with genuine love for fine music performance. The members of the Leggiero Strings & Chamber Orchestra are accomplished chamber musicians & soloists; talented & highly trained. They have performed not only in Manila, but also in various parts of the country and abroad. They have gained many years of experience playing in church weddings & receptions, cocktails, birthday parties, anniversaries, concerts, recordings, TV shows & corporate events. They have performed at the events of prestigious brands & companies and affairs of celebrities & high- profiled personalities. 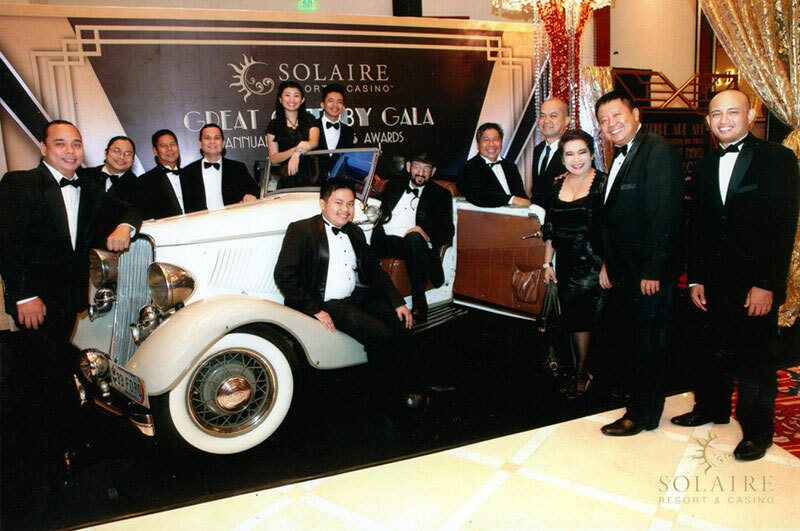 They have played in all the major hotels & restaurants, country clubs, beaches & gardens, and other glamorous places. 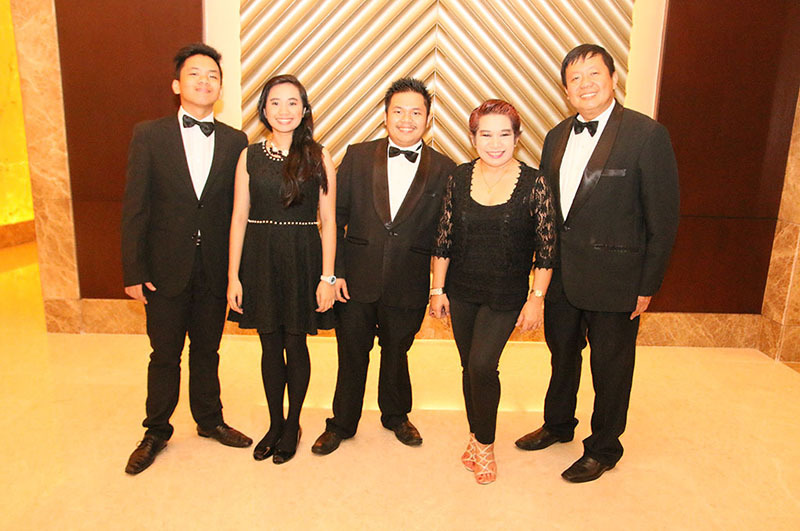 The group offers a vast musical repertoire which includes love songs, standards, bossa, broadway, classics, filipino & current / modern songs. Clients may choose from a variety of string ensembles ranging from Quartet to 20-piece chamber orchestra consisting of violins, flute, cello, bass, accordion, sax & piano. With the music ensemble’s commitment to render excellent music at all times, the group has been highly acknowledged by its satisfied clients. Indeed, a performance of the Leggiero Strings & Chamber Orchestra will add a touch of class & elegance to your event. Hi. This is Merl, the pianist for Leggiero Strings and so is my husband, Jack. Both of us create a mutual appreciation for playing music. Let me share some tidbits on how music played a vital role in our lives. I met Jack way back in 1990 at the concert hall of the Philamlife Theater in UN avenue. Right after my performance in a musical opera, he asked and insisted a common friend to introduce me to him; for he said, he was impressed with my pianistic skills. Wow! A courtship ensued. And naturally, music enhanced our romantic relationship. Wedding bells rang merrily in 1992 at the San Agustin Church in Intramuros. When our children started coming, we immediately exposed them to instrumental playing. Blessed with three musically gifted children; they now play part of the chamber orchestra. We are all wrapped-up in music, like angels heavenly singing psalms endlessly like a music symphony. Imagine a wedding made in heaven. 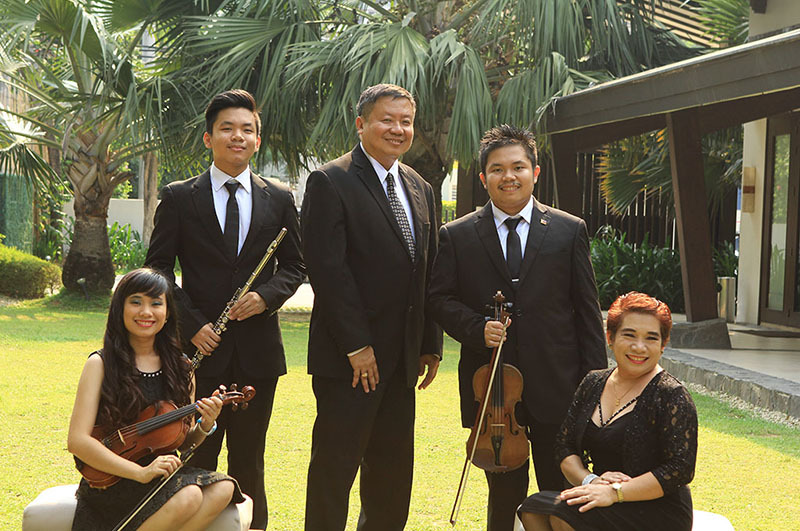 With the country’s best string ensemble, any occasion can be made into a divine celebration. Merlie was born in Angeles City, Pampanga. She began her piano studies at age 10 and later studied with the highly regarded Prof. Carmencita G. Arambulo of Greenhills Music Studio. By the age of 12, she competed in the prestigious NAMCYA (National Music Competitions for Young Artists), the Yamaha Electone Concours and the GMS Best of the Year Piano & Organ Competitions. 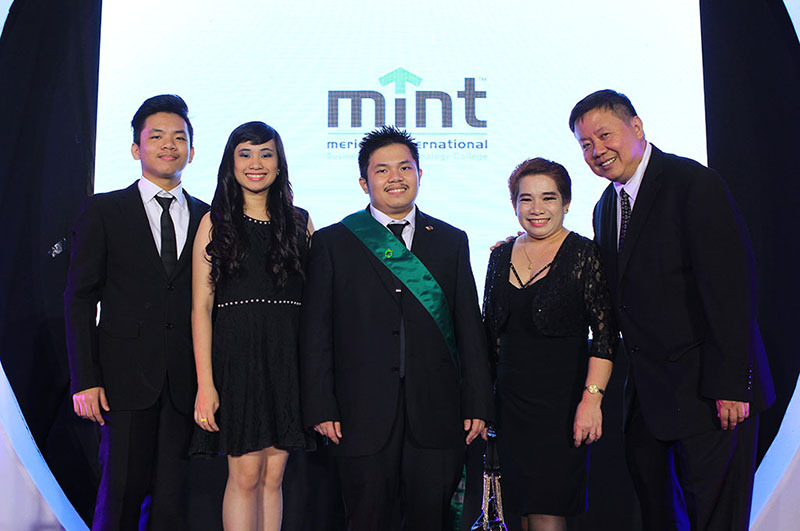 A recipient of Battig Scholarship for 4 years, she graduated in 1985 at St. Scholastica’s College with the degree of Bachelor of Music, major in Piano Performance and Music Education, and garnered the Sr. Baptista Battig Award for her outstanding achievements in the field of music. 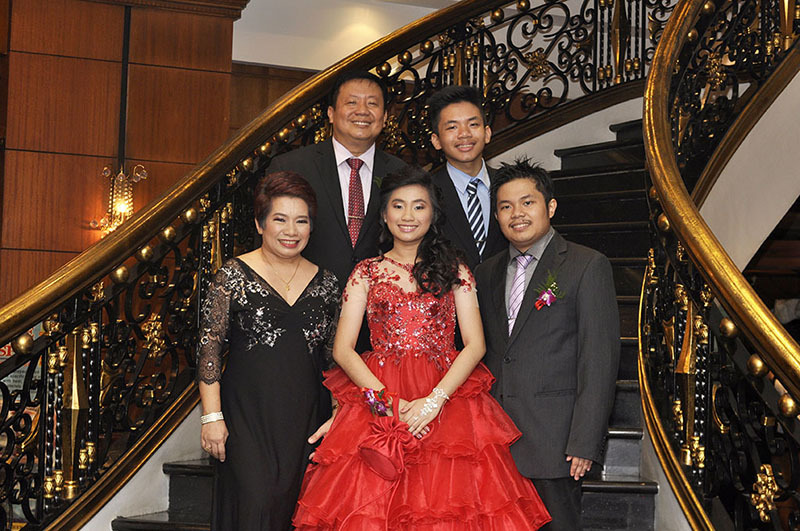 Her early teaching experience started at Holy Family Academy Angeles City. Then, she became a faculty member of St. Scholastica’s College of Music from 1986-2004. As an accomplished chamber musician, she accompanied various chorale groups in competitions and concerts. She was the musical director of the H.F.A. Glee Club Concert ‘88, Letran College Chorale Concert ’90 and Himig Kalikasan Chorale Concert ’90. 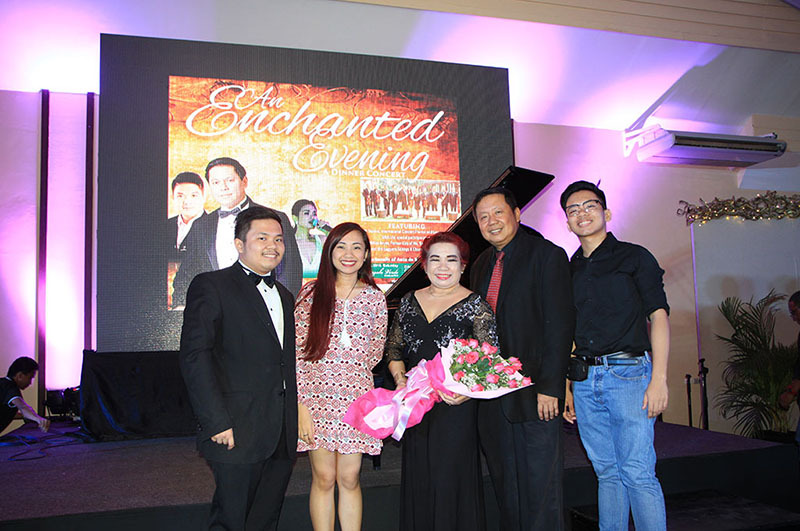 She was an assisting pianist to many St. Scho music graduates in piano, voice, and violin in their college graduation recitals held at St. Cecilia’s Hall & Cultutal Center of the Philippines. She accompanied classical artists in concerts, broadway musicales, operas & ballets. She was the official accompanist at NCCA Intramuros Kundiman Competition 2010. As a performing pianist, she played for Alliance Francaise ’90 @ CCP, Tribute to Levi Celerio ’92 @ Philamlife, P.T.G.P. Piano Festival @ CCP and S.S.C. St. Cecilia’s Concerts ’92, ’93 & 2001. As lounge pianist, she performed regularly at New World Hotel Mkt from 1994-1996, San Francisco Steakhouse Mkt 1995, and Manila Diamond Hotel 1998. Currently, she is a music consultant for weddings & social events and plays for Leggiero Strings & Chamber Orchestra. “Jack” hails from Pasay City, Mla. He is a B.S. 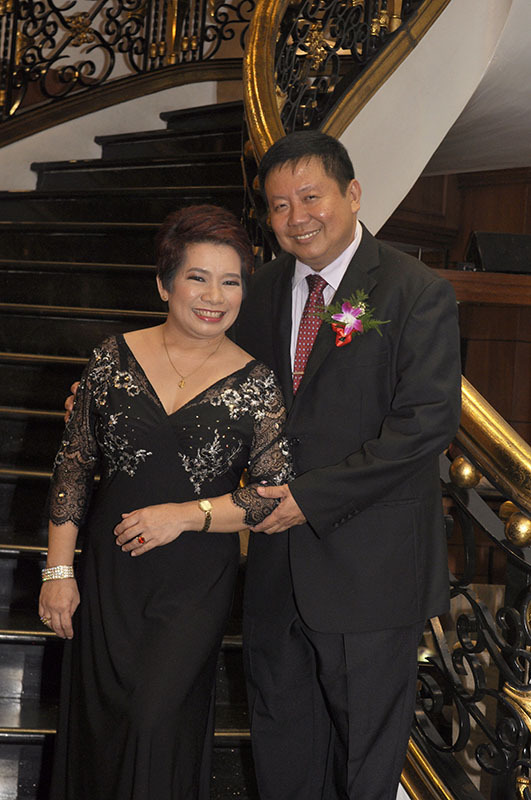 Civil engineering graduate from Adamson University and passed the board exam in 1982. He then worked at Brunei, Darussalam 1984-86 as chief & supervising engineer. Way back in college, he also took piano & music classes at Sta. Isabel College and was under the tutelage of Prof. Cecil B. Roxas. Jack started his music career as choirmaster & liturgical music director of Sta. Clara Parish in Pasay. He also played as lounge pianist in Century Park Hotel 1978-1981, L’orangerie Resto. 1988-89, Intercontinental Hotel Seoul, South Korea 1989, Ilustrado 1989-2000, New World Hotel 1994-2001, and Terry’s Spanish resto 2006-2009. Currently, he also plays for events of Leggiero Strings & Chamber Orchestra. The Leggiero Strings & Chamber Orchestra is a group of professional music artists with true passion and love for fine music performance. Organized in 1993 by pianists Jack & Merlie Yapchulay, the Leggiero Strings & Chamber Orchestra harmonizes music knowledge, performance skills & practical experience with God-given talents; and endeavors to render excellent chamber music at all times, as a response to the music requirements of their clientele. • Strongly promote & elevate the appreciation of chamber music. • Efficiently provide the best music performance for any event. • Excellently perform quality standard and contemporary music. • Successfully fulfill the music needs & requirements of our clientele. • Effectively produce enjoyable music experiences for diverse audiences. • Ardently provide numerous performance opportunities for music artists & orchestral musicians. • Continually develop music instrumentalist & talents drawn from varied professions to become high-caliber musicians. • Creatively nurture our music competencies to find career fulfillment. • Sufficiently support music artists/musicians to live & sustain a good & comfortable life. Music is a very important aspect of a wedding. No wedding can ever be considered complete without music. It creates the perfect mood that you desire for your most special day. Since music sets the tone of your wedding, consider carefully what will make yours a special event. You have several options. For a traditional, uplifting dramatic wedding ceremony and a formal & sophisticated wedding reception, you may consider a singer/soloist, a duet, a vocal ensemble or a choir, an organist, a harpist, a classical guitarist, an acoustic ensemble, a quartet or even a chamber orchestra. For a fun and loud atmosphere in a wedding reception, you may consider a popular music band, a saxophone player, a Latin group, a jazz/brass band or a rock & swing live band. Do your selection carefully. Remember the music, that the group will create, will represent you, your taste and the ambiance you want your wedding to have. This makes the selection of the style of performers a difficult task. After having secured both your ceremony and reception venues, start your search for your wedding musicians as early as possible. But first, be aware of any requirements and rules pertaining to musicians; or guidelines set by your wedding venue. Check the site of your ceremony or church and ask if there are restrictions about the types of music allowed. Some have strict rules about types of music, instruments played and amplification. It is best to follow these restrictions to avoid possible conflicts and last-minute changes of plans. You must take all these into considerations when you choosing your wedding musicians. How to Find Wedding Musicians? Ask for recommendations. Ask your family, friends and acquaintances. If you have a caterer, ask for referrals. “Word-of-Mouth” is one of the best ways to find excellent musicians to play for you. If you attend a wedding or any special occasion and like the sound of the live music. Be sure to ask the musicians for a business card. Attend bridal fairs/shows. Most likely, you’ll see some performance showcase. Search the internet; find listing of all types of musicians. Interview at least 3 musical groups. Call and request for a brochure. When calling, were you greeted cordially? Were you given the complete information you need? Was the person you spoke with helpful? Courteous? Accommodating? Be sure what you feel comfortable with the group’s leader as you will be working closely with the person. Feel free to ask for references from their previous clients. Visit their websites and check it out. It should provide you with the information you are looking for. Does it show a recording of the group’s performance? Does it provide a demo with sample of their performance on video? There are a few more elements you need to pay attention to. Did the group merit good references? Can they offer you what you want on your terms? If planning your wedding is time-consuming for you, then you should consider hiring a highly satisfied professional musician with established credentials. They should be accomplished, talented musicians. They should have experienced playing in numerous wedding ceremonies and receptions. They should have a substantial repertoire; varied, extensive, balanced and appropriate. They should accommodate playing music requests. They should make excellent music recommendations in your wedding repertoire. Finally, you will have to consider the budget. Budgetary constraints and prices of various music groups will certainly be issues. But QUALITY SHOULD BE YOUR MAIN CONERN. Think about the over-all entertainment value and not the price. This way, you wedding will be more memorable and satisfying experience for you and your guests. So plan months ahead and BOOK THE BEST MUSICIANS IN ADVANCE. Can you provide music for both ceremony and reception? Will you provide us with a list of songs and music selections to choose from? Will you accommodate special request for songs or musical pieces we would like played at our wedding? Will you accommodate guest singers? What are your playing hours? Will you be able to extend your playing time should we want you to stay longer than planned? How long have you been playing in weddings? How many wedding clients have you served? How often and for how long do they take a break? Do you provide your own instruments? Do you require guest meal? Or crew meal? Do you require transport service?